I'm almost embarrassed to say that I've just recently discovered the wonders of homemade bacon, despite having a food blog for four years. No, scratch that, I am embarrassed! It really is sad, and I repent here and now for all the world to see. 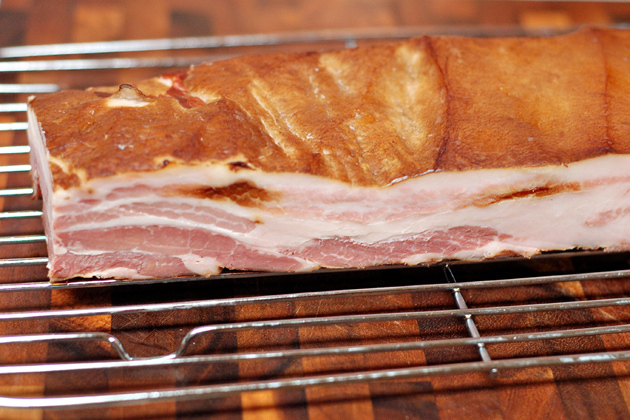 For some reason making homemade bacon is shrouded in some sort of strange and mysterious veil of complexity. Once you see how easy it is it's like you've been smacked in the head with a clue-by-four. This compounded my embarrassment. My friend Meathead over at AmazingRibs.com (a great barbecue site, by the way) wrote the following, and he's absolutely correct. 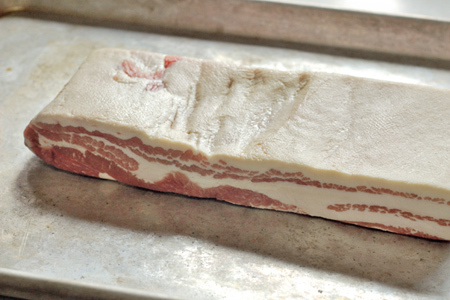 Makin' bacon is surprisingly easy and the results are quantum leaps better than the stuff from large commercial producers. Once you have the basic recipe down, you can vary the ingredients to make a flavor profile to suit your taste. It is a simple two-step process: (1) Curing, and (2) smoking. Here, let me show you how easy this is. My recipe is simpler than Meathead's, but the results are incredible. About the pork belly: Get the best that you can find, preferably locally-sourced and all-natural. Unwrap the belly, rinse it, then pat it dry with paper towels. Sprinkle the Tender Quick® evenly over the entire outside of the belly (don't forget the edges), put it in a gallon-sized zip-top bag and seal, removing the excess air. Refrigerate seven to ten days, turning and massaging the bag every two days or so. Start your smoker and prepare for indirect cooking at low heat (about 225-250º). Use whatever smoke wood you like. I used a blend of 2/3 hickory and 1/3 cherry which worked beautifully. 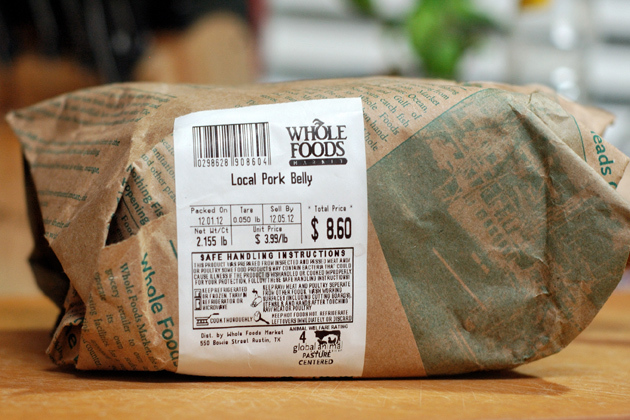 Remove the pork from the zip-top bag, rinse well under cold running water, and pat dry with paper towels. 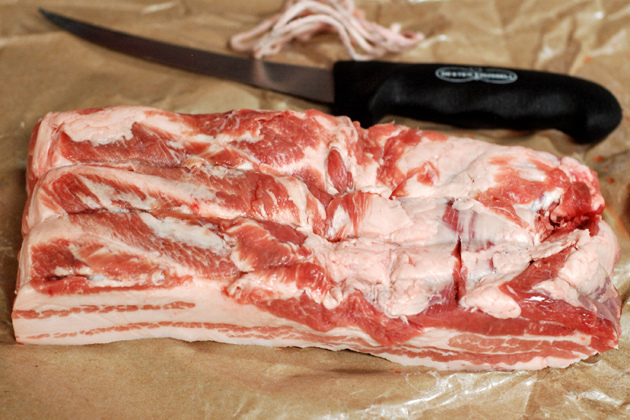 Smoke the belly indirect until it reaches an internal temperature of 150º. Remove it to a plate, rinse under cold running water (to help cool it quickly). Pat dry with paper towels, wrap tightly in plastic wrap and refrigerate. It'll keep in the refrigerator up to two weeks. Slice, cook as you normally would, serve and enjoy! Now that you have some killer bacon, go make yourself some pig candy. Looks...simple! So,wait. Is that final "up to two weeks" part of the process, or the shelf-life? In other words, should I wait two weeks until I slice it, or do I have up to two weeks to slice and consume it? Thanks for the heads-up. I've clarified/corrected that part. it's even better when you wait 12-24 hours after rinsing, leaving the bacon to become slightly sticky on the outside - lets the smoke stick better and the flavours develop. Also great if you add some herbs and spices to the dry rub. We like garlic, bay leaves and some juniper berries rubbed in with the curing salt. Does it freeze well? Like can you cut it into 1/2lb sections maybe and freeze to use and slice later? Elias - Yes, it freezes just fine. I'd say that it's probably good for at least a couple of months. Very interesting, I never thought about making my own bacon. Sounds wonderful. I can't believe it's that easy! Thanks. This is a "must try" recipe. is it better to create your own ham? how about the budget? Do you recommend removing the skin from the fat cap or leaving it on? Aaron - You can go either way, but I'd remove it. If you leave it on the smoke doesn't penetrate as well. I don't have a refrigerator, I live kinda simple that way. I have to drive into town just to use this computer. Once the cure is on does it really need to be refrigerated or just in a cool place? Anonymous - No fridge? Wow! 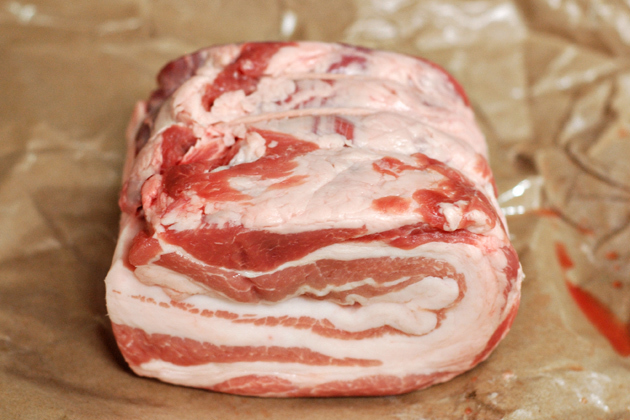 The pork must be kept at 38º or colder for the entire curing time. much more healty with salt ???? Anonymous - I'm just devious like that. Plus, sodium nitrate is a preservative, so it'll preserve me. Cool, huh? 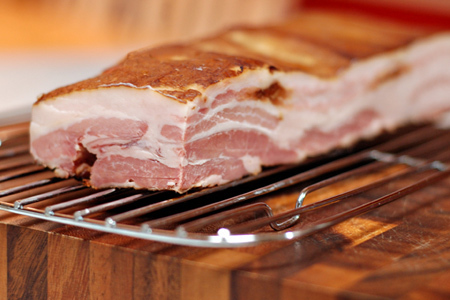 @ Anonmous The Sodium Nitrate prevents bacterial growth during the cold smoking process. Nitrate salts have been used in the curing of meats for centuries if not millenia. To not use Nitrate on a meat the will be kept in a 200 degree environment for hours can be very dangerous. Anonymous - Actually, salt also retards bacterial growth. Meat has been cured in salt far longer than in nitrites/nitrates. There's nothing wrong with curing with salt. No nitrates for me. Use salt. Anonymous - You go, girl! First off, thank you for your generosity of sharing all your recipes. I know this is an older post but I was wondering, you say to put it in a zip top bag and then turning and massaging. Is it possible to just vacuum seal it? Also, could you cold smoke this or do you only recommend smoking at 225-250? Rick - Vacuum sealing would be preferable, as would cold-smoking, provided that you can maintain the heat at or below 90* F for several hours.